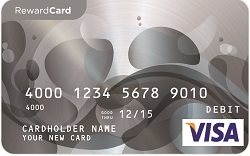 A Virtual Visa Reward can be redeemed for a Visa Virtual Account, ready for use instantly. Use your account at merchants worldwide where Visa is accepted online, over the phone or for mail-in orders. Virtual Visa Rewards are delivered in the form of a Promocode and must be redeemed for a Visa Virtual Account before usage. Virtual Visa Rewards are available in $5 - $500 denominations. Contact your NGC sales representative to start ordering these via your ngcdirect account today!